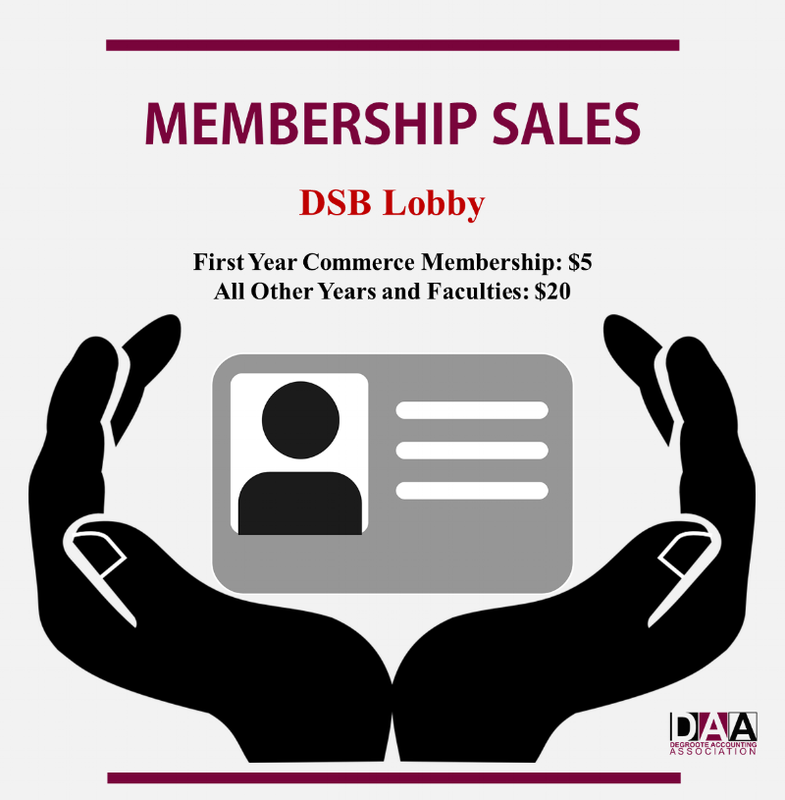 Join the DAA Executive Team for the annual First Year Mixer, held on campus in the Commerce Lounge. This is your opportunity to mingle with fellow first year accounting students and the DAA Executive Team. Please note that the dress code is casual. This event will connect members with our executives as well as inform members about our events and plans for the upcoming year. Pizza and refreshments will be provided. The AGM will be held on September 19 from 5:00 p.m. – 6:30 p.m. Recruitment season is approaching! The annual CPA Night hosted by the DAA is an excellent opportunity for students to network with industry and professional services firms seeking to hire accounting students. Save the date and be sure to attend this highly anticipated event! Internships (Years 1, 2, & 3): 4:00 P.M. - 5:00 P.M.
Come by the DAA table and get an early networking session with a few of our top execs. You'll get a good understanding of who we are, what we offer, and where you can see yourself within our association as you begin your McMaster journey. It's your time to play fraud investigators! McMaster’s CPA BOA and the DAA is proud to announce McMaster’s very first Forensic Accounting case! Through a forensics case centering on fraud and ethics you will have a chance to explore the fast expanding field of Forensic Accounting with a professionally developed case! So, what are you waiting for? Register now! There will be monetary prizes!!!! In addition top contestants will have a chance to go to CPA’s LEAD to Succeed Competition. Can compete individually or in a team of two. Interested in getting involved this year? Deadline for applications: September 17th, 2017 @ 11:59 p.m.
Visit the DAA booth in the lobby of the DeGroote School of Business, and talk to our executive team about opportunities for you to get involved this year. Free food will be provided by the DCS! Are you a first year student interested in getting involved? 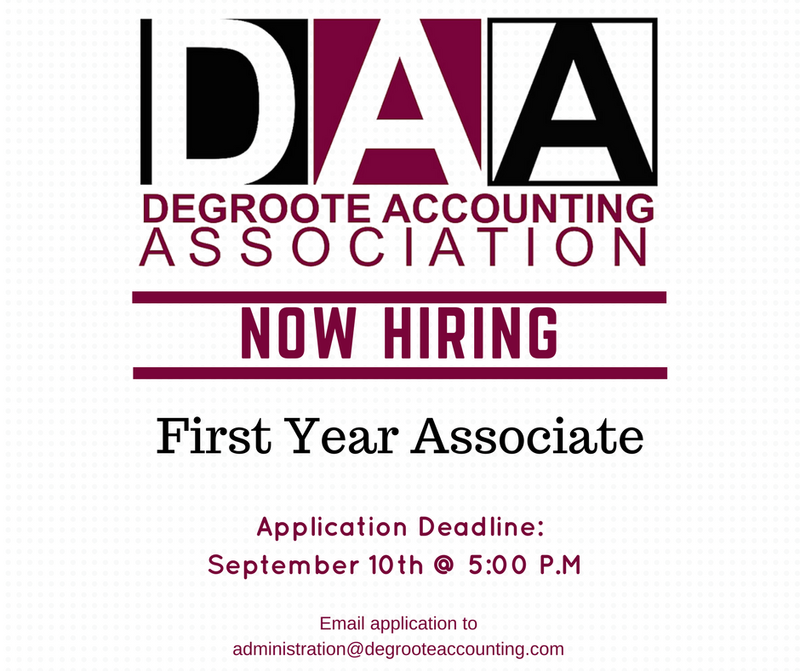 DeGroote Accounting Association is now hiring a First Year Associate to join the team. KPMG invites you to come out to their information and networking session to learn more about the annual Executive Look summer conference. Take this opportunity to get an inside look at the biggest National Campus Program and get the chance to network with KPMG professionals who have a key role in the selection process. Register now through Oscar Plus! Ready to experience the Deloitte difference? Come out and learn more about Deloitte and the summer conference. Deloitte is redefining what it means to be a professional services firm - business as usual just won’t cut it. The exclusive 2.5 day summer conference, August 16- 18, 2017 in Toronto, ON, is no exception. You will have the opportunity to expand your horizons and elevate your potential! Join Deloitte on campus to learn more about this exciting opportunity! Are you considering your future career and wondering if Accounting is right for you? This is the workshop to learn more! - Learn more about a typical recruitment process for an accounting role and how to best utilize resources on-campus for employment success! Are you interested in attended PwC Canada's Talent Academy? Don't miss the Talent Academy Information Session; this will be an event held at the PwC Tower at 18 York Street in Toronto on Monday, February 27, 2017 from 3:00 p.m. - 6:00 p.m. Spaces are very limited, register today through OscarPlus! Applications for Talent Academy are now open. Please click here to register. Light refreshments and snacks will be provided. The Designation Panel Discussion is a unique opportunity for students to compare the CPA, CFA, and CBV designations side by side. The event is designed as an interactive panel discussion where students can ask questions about each of the designations. This is a great opportunity to network with representatives from each designation! The dress code for this event is business casual. Pizza and refreshments will be provided. DAA membership and registration are required. Click here to register. Join PwC on campus to connect over a casual coffee and career chat! Bring your questions about your career, and let PwC representatives help you to navigate the recruiting process from resume writing to interview and networking tips. This workshop is designed to target those students interested in pursuing accounting roles within CPA firms. Review the do’s and don’ts of resumes, cover letters, interview skills and networking! Visit OscarPlus to register today! Join the DAA Executive Team for the AGM & Members Mixer, held on campus at TwelvEighty Bar & Grill. This is your opportunity to mingle with students and the DAA Executive Team. Please note that the dress code is smart casual. Appetizers will be provided. Are you considering applying to DeGroote’s Graduate Diploma in Professional Accountancy? Applications are due Tuesday, January 31, 2017. Join Program Chair, Professor Khalid Nainar for an information session to learn what you need to do in order to take part in this exciting program opportunity. Registration on OSCARplus is required, as seating is limited.